Background: Aescin or β-escin is the main and active constituent of horse chestnut seed (Aesculus hippocastanum) used for the treatment of inflammatory edema, venous insufficiency and ischemic ulcerations. Aescin has many actions due to induction of endothelial nitric oxide and prostaglandin F2-α production moreover; aescin antagonizes the effect of histamine and 5HT at receptor levels. Objective: The aim of the present study was to evaluate the neurobehavioral effects of aescin on normal healthy volunteers. Method: A total number of 65 healthy participants with mean age of 21+1.1 years were recruited to study the effects of aescin on the neurobehavioral effects of normal healthy volunteers compared to placebo. The neurobehavioral effects were assessed by psychomotor performances and sensorimotor reaction, cortical arousal and central integrity processes and assessment of memory capacity. Results: Placebo produced insignificant amelioration of TRT and RRT p>0.05, with mild significant effect on MRT p=0.03. Aescin produced a significant effect in the amelioration of psychomotor performances and sensorimotor reaction p=0.0001. 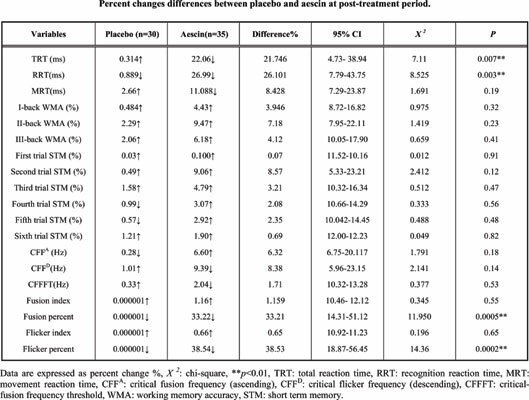 Regarding the differential effect of placebo and aescin on the cortical arousal and central integrity processes, placebo illustrated insignificant effect at p>0.05 whereas; aescin showed mild significant effect on Critical Fusion Frequency (CFFA) p<0.05 and highly significant effect on the other parameters p<0.01 except for critical-fusion frequency threshold when aescin illustrated insignificant effect at p>0.05. Aescin illustrated significant acceleration of ІІ-back WMA, ІІІ-back WMA and Second trial Short-Term Memory (STM) at p<0.01 compared to the placebo effect. Conclusion: Short-term therapy with aescin improves the neurobehavioral effects on healthy volunteers. Neurobehavioral, Aescin , placebo, β-escin, psychomotor, sensorimotor, cortical arousal.